But for me, the answer is simple – I was a reader and then at the ripe old age of 7 I became both. But for every book that has slipped through my cerebrum, there are the few that stick like thick pancakes to your stomach lining. Each Friday I would like to share one of those books with you. My list of personal favorites. Maybe you will have read them, maybe you haven’t yet – either way I would love to hear your opinion. To kick off this new line of blog posts I’m going to start with a wonderful book by George Orwell: Down and Out in Paris and London. Published in 1933, more than ten years before the acclaimed Animal Farm and sixteen years before Nineteen Eight-Four, Down and Out follows George Orwell as he lives in squalor and sometimes locked up in prison blocks while taking on the life of those in poverty. Yes, this sounds like a politically based book that shoves a part of the world in your faces most would like to pretend doesn’t exist – but that’s not it’s all about. Yes, there was, and is, an underlining issues of how the poor have been treated through time – but the story is really about the people he meets along the way. 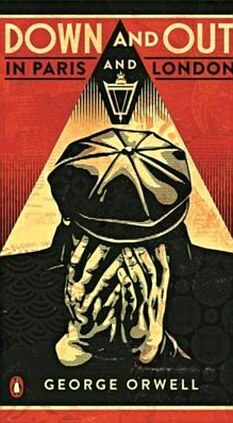 As Orwell bonds with his subjects and they begin to trust him, you are transported to a world filled with lines, crusty bread, broken beds, repugnant bathing water, and incredible and indestructible people deal with the stigmas day in and out – for most of their lives. Sometimes, he said, when sleeping on the Embankment, it had consoled him to look up at Mars or Jupiter and think that there were probably Embankment sleepers there. He had a curious theory about this. Life on earth, he said, is harsh because the planet is poor in the necessities of existence. Mars, with its cold climate and scanty water, must be far poorer, and life correspondingly harsher. Whereas on earth you are merely imprisoned for stealing sixpence, on Mars you are probably boiled alive. A fantastic read, and if you happen to have an eReader, chances are you can download a copy for free from your local library – or you can read it online at -> http://www.george-orwell.org/Down_and_Out_in_Paris_and_London/0.html. Happy reading! Happy writing! Happy Friday! If you have any books you love and would like to recommend them to me, please list them in the comments below.